A look at Larry Holmes opponents. The men Larry Holmes faced in his reign as world heavyweight champion, the men who helped to define his legacy. Larry Holmes wins the WBC title against Ken Norton in 1978. Alfredo Evangelista,1978 record 24–2. Oct. 1978. After going 15 rounds with Muhammad Ali for the world heavyweight title in 1977, Alfredo would go on to KO Jean Piere Coopman in the first round, as well as to string together 10 straight wins with 8 stoppages among them. After the Holmes fight, he would go on to face Leon Spinks and Greg Page losing to both of them. He then went on to beat Renaldo Snipes and tough journeyman Terry Daniels. Many would argue that Evangelista was a soft title defence for the new champion, he was however a capable and sturdy opponent who had earned his spot among the upper ranks of top big men. Ossie Ocasio. 1979 record 13–0. March 1979. Prior to his Holmes fight, Ocasio had just won two decisions over the skilled boxer Jimmy Young who had recent wins over Ron Lyle and George Foreman. It was these two fights over Young which saw Ocasio face off against Holmes. Young’s stock was that high at this time, so such a victory gave Ocasio a great degree of credibility as a prospect and challenger. After the Holmes bout Ocasio fought Michael Dokes to a draw, and in his older years would win decisions over Dwight Muhammad Qawi and Pierre Coetzer. Ocasio showed his talent against Young and though his career was less than stellar in the eyes of many ‘experts’ there after, he did manage to stay relevant as a cruiser and heavy for some years. Mike Weaver.1979 record 19–8. June 1979. The hard hitting Weaver had suffered a fistful of losses early in his career including a seventh round stoppage to great white hype Duane Bobbick, the man who had beaten Holmes for the Olympic trials in 1972. Leading up to the Holmes fight Weaver beat and lost to a few suspect opponents his best win was a points victory over the tough Pedro Lowel and a fifth round stoppage of Bernardo Mercado. It was because of the Holmes fight and his subsequent success that Weaver really gained credibility. After the Holmes fight Weaver would go on to win the WBA title by beating John Tate, and in defending this title he would defeat brutal punching Gerrie Coezter in the thirteenth. Weaver would also win a close decision over forever contender James Tillis. He would lose his title to Michael Dokes, only to re-match for it with a draw being the outcome. After some more losses to better fighters, and a string of wins over journeymen, he would go on to KO Carl Williams inside two rounds, and beat Bert Cooper in 1993. Weaver would go onto face Holmes again when both men were well into their forties. Mike Weaver was in the top ranks of heavyweight boxing for years to come. He was a capable trial horse even after his own title reign, despite his early set backs Weaver established himself as one of the legends of the era. Holmes had already defeated the hard hitting Shavers in an eliminator fight with the victor going on to face champion Ken Norton. Shavers was granted a title shot after he had stopped former champion Ken Norton inside round one. Prior to this Shavers had faced a who’s who list of top 1970s heavyweights, before his first Holmes loss, he had just gone 15 rounds with Muhammad Ali for the title. An always dangerous fighter, Shavers would go onto stop Joe Bugner in 1982 as well as lose some more fights of note, his power was always present to be demonstrated against lesser opponents in his final years as a prize fighter. Earnie Shavers is credited as being the hardest hitting man ever to have laced on leather. Lorenzo Zanon. 1980 record 25–4–2. February 1980. Leading up to the Holmes fight Zanon had suffered two losses to the likes of Jerry Quarry, who he had out boxed until being KO’d, to Ken Norton, giving Norton a tough fight until he was stopped. His best wins in this period were against Evangelista who he bested twice winning the EBU title from him. His other notable fights also in Europe were a win against Italian fighter Avenamar Peralta and a draw against talented Alfio Righetti . Zanon brought a European title to the Holmes fight and thus some perceived prestige. After the Holmes bout Zanon fought four more times with mixed results and would go on to retire. Leroy Jones.1980 record 24–0–1. March 1980. A physically big man who at 6’5 and 255lb posed a threat to most opponents, bringing to the ring a good amateur background, Jones was a skilled boxer. Prior to his title challenge against Holmes, Jones had a near perfect record with just one draw against Pedro Lovell, his best wins were against Mike Weaver, John Dino Dennis and journeyman Jody Ballard. After his Holmes loss, he had one more fight and then retired due to an eye injury. Scott LeDoux. 1980 record 26–8–4. July 1980. LeDoux gave Foreman a tough fight, in their brief but exciting 1976 bout. LeDoux around this time before his title challenge also managed to take Leon Spinks and Ken Norton to a draw. He faced top competition and was a competent contender, who would go on to fight for another three years with a 7–4 record over a mixed grade of opponents. Though he was not the most skilled fighter of his age he certainly had one of the biggest hearts. Muhammad Ali.1980 record 56–3. October 1980. There is no dispute that the Ali that fought Holmes should have retired in 1978 with his win over Leon Spinks, but for whatever reason the former champ felt a need to return and the public who felt he was the true champion granted him another chance. Holmes though reluctantly stopped the legend in a one sided bout that saw Ali not land a single effective punch. It was to be Ali’s only stoppage defeat. After the Holmes fight Ali would have one more fight against Trevor Berbick and he would lose this fight also. No one would argue that Ali was not a super talent, unfortunately age and ring damage had taken their toll and the Ali who faced Holmes would have struggled to defeat a 52 year old Holmes that bested Butterbean in 2002, let alone the near perfect 1980 Larry Holmes. Trevor Berbick.1981 record 18–1–1. April 1981. Berbick’s best performance immediately prior to his Holmes fight was a ninth round KO over John Tate, before that he had faced average opposition and suffered a loss to Bernardo Mercado. After his Holmes loss the big Jamaican would beat an elderly Ali, and decision the likes of Greg Page, Mitch Green and Pinklon Thomas. Berbick managed to stop Holmes victory by stoppages streak in their 15 round bout. As an older past his prime fighter he faced varying opponents with mixed results. Besides his win over Ali he is also best remembered for his stoppage loss against a prime Mike Tyson who stripped him of his WBC belt. Berbick was a solid and awkward fighter who managed to hold his own even into the 1990s when he became a trial horse name sake fighter for the likes of future champions like Hasim Rahman. Leon Spinks.1981 record 10–2–2. June 1981. The Olympic gold medalist had been catapulted into sports stardom due to his win over Ali in 1978, just seven fights into his pro career, he become heavyweight champion of the world over the ‘Greatest’. Before his second shot at the title against Holmes, he was stopped by the tough South African Gerrie Coetzee. Thereafter he would stop Alfredo Evangelista, Curtis Isaac and Bernardo Mercado, it was his namesake however that made him a credible contender. After his Holmes loss he fought at both Heavy and Cruiser weights with mixed results losing a good many bouts to a mixed bag of fighters. His style was aggressive and awkward, but it was his lack of heart and work ethic that saw him fall short of the fame he had so early gained. Renaldo Snipes. 1981 record 22–0. November 1981. The tricky Snipes leading up to his fight with Holmes had strung together a perfect record, with recent wins that included the likes of Floyd Cummings, Eddie Mustafa Muhammad and Gerrie Coetzee, these victories put him in line for a title shot. After giving Holmes a tough fight Snipes went on to suffer a cluster of losses to top fighters as well as journeymen, his best wins post Holmes were against Trevor Berbick and Johnny DuPlooy. Snipes was an under developed fighter who had solid in ring character. Dropping Holmes with a single shot, despite being dominated by the champ earned him a great degree of credibility which perhaps harmed his progress as a fighter after this fight. Gerry Cooney. 1982 record 25–0. June 1982. The great white hope, or hype whichever you view him as, Cooney in 1982 was a very real contender. Despite being well marketed and a darling of the public, Cooney was a hard hitting destroyer who was able to land both men a grand pay day for their bout. Leading up to his showdown with Holmes, Cooney early on had cut his teeth with a stoppage over John Dino Dennis, and then in 1980 he stopped a still very effective Jimmy Young inside four brutal rounds. It was with his first round stoppages of Ken Norton and Ron Lyle that landed the hard hitting Cooney a title shot and confirmed him as the ultimate challenger for Holmes’ title. After his Holmes loss, Cooney meandered as a fighter. He managed to string a handful of stoppage wins only to himself be stopped by Michael Spinks, and in 1990 after a three year lay off he was stopped by the also returning George Foreman. Cooney had devastating power and before Holmes he had stopped all but four of his opponents. Many claim that Cooney peaked for the Holmes fight and he perhaps proved that point as he would never regain the fire that had made him such a dangerous contender. Randall ‘Tex’ Cobb.1982 record 21–2. November 1982. The match between these two caused great controversy as Holmes was able to completely dominate and won every round. Before facing Holmes, ‘Tex’ Cobb was fresh off an eighth round stoppage of an always dangerous Earnie Shavers, in this fight he proved that he could take punishment as well as dish it out. He then went on to lose two close split decisions fights against Ken Norton and Michael Dokes. It was in these close fights that ‘Tex’ Cobb proved how tenacious a fighter he can be. After the Dokes loss he went on to string four straight wins together which included a decision victory over the tough contender Bernardo Mercado. Cobb went on after the Holmes loss to beat Leon Spinks and lose a majority decision to an up and coming Buster Douglas. Cobb was also an accomplished kickboxer in the then fledgling sport while also being an entertaining character actor. Lucien Rodriguez. 1983 record 35–7–1. March 1983. The Frenchman, Rodriguez brought with him the European Union title. Leading up to his Holmes title challenge Lucien had lost a decision to Michael Dokes, after which he strung together 11 wins over European opponents including Alfredo Evangelista. After the Holmes fight Lucien would fight in Europe with mixed outcomes, losing as many as he won. Rodriguez was a competent European fighter who provided an awkward style, despite this he never went on to accomplish any real greatness despite working hard near the top. Tim Witherspoon. 1983 record 15–0. May 1983. Before his title challenge Witherspoon had defeated all of his opponents, most he had stopped with his powerful overhand right which he would further improve later in his career. It was his close decision over Renaldo Snipes which saw him gain a title shot against Holmes. The young former Ali sparring partner, ‘Terrible’ Tim was able to give Holmes a close fight in their championship meeting. After which Tim Witherspoon would go on to defeat the likes of such talents as James Tillis, Greg Page, James Broad, James Smith, Frank Bruno, Tony Tubbs, Carl Williams, Jose Ribalta, and Jorge Luis Gonzalez. He would win the WBC and WBA title on separate occasions and would fight on well into his silver years, still able to deliver a damaging blow with his overhand right. Tim Witherspoon would earn a solid spot in the heraldry of the sport as one of the top guys from his era. Scott Frank. 1983 record 21–0–1 September 1983. The local tough guy, who brought a title fight to his home town, Frank’s best fights prior was a draw over Renaldo Snipes, a points win over journeyman legend Chuck Wepner, and a stoppage over fellow tough guy challenger Ron Stander. Other than that he had beaten all of his other opponents who were of less fame and note. After his Holmes loss, Frank retired and made two comebacks one in 1987 and the other ten years later in 1997, he won both fights by stoppage. Although Frank had earned his wins, and was a tough guy. He was less than deserving of being inside the ropes with a prime Larry Holmes. Marvis Frazier.1983 record 10–0. November 1983. The son of Smokin’ Joe Frazier, Marvis himself was a talented amateur who under his father’s guidance became a solid pro. Leading up to his fight with Holmes, Marvis had an unblemished record with wins over Steve Zouski, James Broad and Joe Bugner. None of those victories did him any good against the prime Holmes who stopped him inside the first round however. After his Holmes defeat Frazier put together a solid winning streak which included wins over James Tillis, Jose Ribalta and James Smith. This put him in sight of a up and coming Mike Tyson, where he was stopped inside of one round. After the Tyson loss, he had three more straight wins before retiring. Marvis Frazier was a talented and under appreciated fighter who lived in his father’s shadow and is sadly only remembered for his two losses against prime superstars. Perhaps if Marvis had campaigned in the newly created cruiser weight division he would be remembered for much more, but he was a tough over achiever and that carried him far enough. James Smith.1984 record 14–1. November 1984. James ‘Bonecrusher’ Smith was on his way up when he challenged Holmes for the title. Apart from a loss to James Broad in his first fight, Smith had strapped together 14 straight wins, which included a win over tough Briton, Frank Bruno. It was this win that gave him the credibility to face Holmes. After his loss to Holmes, Smith suffered three more losses before he stuck together wins over Mike Weaver, David Bey and Tim Witherspoon who he took the WBA strap from. This lead him into a show down with Mike Tyson, who he managed to go the distance with in a one sided loss. Smith would go on to fight a variety of opponents and with a variety of results. Smith faced Holmes again in 1999, both men well beyond their best, it only took Holmes eight rounds in the rematch. Bonecrusher was a solid professional who stayed credible for much of his career, though he was part of the lost generation of Heavyweight boxers he was always found near the top of the rankings. David Bey.1985 record 14–0. March 1985. When he fought Holmes, David Bey was undefeated and had won fights against Buster Douglas, who was five fights into his pro career while Bey was making his own debut. His best win was against Greg Page which led him into a Holmes title fight. After which he lost more than he won, settling in as a journeyman instead of a contender. Before turning pro, Bey had an impressive amateur record which brought to the ring considerable experience on his part, considering his limited pro-record. David Bey was a tough fighter with a lot of character who settled into a place as a contender and gate keeper to the big time for many fighters, such as his fight against Olympic gold medalist Tyrell Biggs in their classic showdown. Carl Williams. 1985 record 16–0. May 1985. When the Carl ‘the Truth’ Williams faced Holmes he was an unbeaten prospect with a lot of potential who had just come off wins over a list of sound journeymen. It was his win over James Tillis however that landed him the Holmes fight. After losing the close controversial decision to Holmes, he beat a handful of opponents including Bert Cooper and Trevor Berbick before facing Mike Tyson for his title, where he was stopped inside of the first. After the Tyson loss he had an unexceptional span of wins and losses, still lingering around the top only to become delegated as a tough trial horse for up and comers or nearly rans, despite this he managed to produce some tremendous fights like the one he had against hard hitting Tommy Morrison. Larry Holmes would then lose his title to former Light Heavyweight champion Michael Spinks in a close and controversial decision. He would soon rematch Spinks, again losing in a debatable decision. 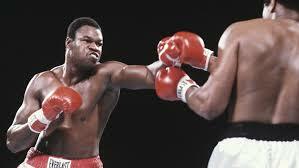 After which Holmes retired only to return three years later to face a prime Mike Tyson in 1988, Larry Holmes was 38. After the Tyson loss he returned in 1991 with a comeback that lasted up until 2002. In his comeback 1991–2002 he went 21–3. Before his decision defeat to Michael Spinks in 1985, his record was an impeccable 48–0. Holmes faced everyone that he could, often fighting fresh talent as they were on the way up or just as they were reaching a prime. He was an older man facing young and hungry fighters. Larry Holmes was one of the most dominant champions in boxing, he was wedged between the likes of Muhammad Ali and Mike Tyson which has in some ways dimmed his star. Further more the era of boxing that fighters like Holmes navigated were marred by the wider politics of the ABC gangs which held the titles. Boxing is a sport of imperfect platforms, it takes a great talent and some times some luck for a fighter to stand head and shoulders above his competition. While Holmes will have his detractors, all fighters shall suffer this curse, most can not argue that he was one of the best, if not the best big man to ever command the ring of boxing. The top fighters of his reign that Larry Holmes never got to fight include Greg Page, Gerrie Coetzer, Jimmy Young, James Tillis, Frank Bruno, Tony Tucker and Tony Tubbs. There was an attempt to unify the WBA and WBC strap but politics prevented this fight happening between Larry Holmes, the WBC holder and Gerrie Coetzee, who had the WBA strap. The challengers that Holmes was going to face that were top guys at the time Greg Page, James Tillis, Jimmy Young, John Tate, Tony Tucker, Tony Tubbs, Frank Bruno and Gerrie Coetzer all were eliminated by one of the guys that did go on to face Holmes. Jimmy Young lost twice to Ossie Ocasio. Which pushed Ocasio into a fight for Holmes’ belt. Trevor Berbick had beaten John Tate, which eliminated Tate and gave Berbick the shot at Holmes. Renaldo Snipes beat Gerrie Coetzee, which could be argued eliminated Gerrie and put Snipes in line for Holmes. Gerry Cooney helped eliminate Jimmy Young again in his defeat over the tough contender. James ‘Bonecrusher’ Smith’s win over Frank Bruno eliminated the Briton from facing Holmes and elevated Smiths status as a title challenger. David Bey got his shot by beating Greg Page, which in turn eliminated Page from facing Holmes. Carl Truth Williams beat James Tillis which landed the Truth his fight against Holmes, this in turn eliminated Tillis from facing Holmes. Granted, he did face some not so great guys, but when you fight that many challengers that often occurs, as is the case of Joe Louis, Tommy Burns and so on you do face some guys who are not all time greats. In time I shall delve into the challengers of the other greats. Next Post Somebody has got to lose.